The EU@Interbike Village is a dedicated turnkey booth section designed to highlight European brands seeking to enter the US market for the first or second time. inMotion mar.com is your Sales Service Agency for the EU@Interbike village. Brands must be a new (or second year) exhibitor at Interbike, must be ready to initiate distribution of products into the North American market the following year and must have company headquarters in Europe. This limited-space opportunity is designed to be an incubator of sorts for these brands, with a 2 year limit on participation in the area. 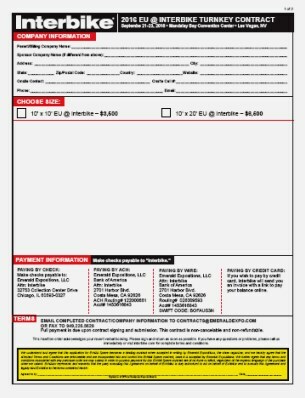 If you are interested in participating please fill out below contract, scan and email to us and to our colleagues in the US. To support your participation at Interbike we also offer PR, translation and creative services (f.e. booth, promotional, advertising and merchandise design and production). Other show related services can be made available upon request. Maybe the Outdoor Demo is also interesting? It’s now 3,5 days of product testing for consumers, dealers and media prior to the indoor show! 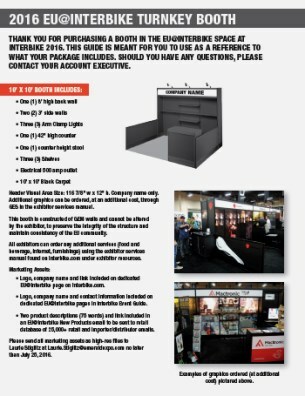 https://www.interbike.com/events/outdoor-demo, standard exhibitor rules/cost account here. Interbike today announced further details of the annual Industry Breakfast that it is presenting in conjunction with PeopleForBikes and the National Bicycle Dealers Association on Tuesday Sept. 18, the opening day of the show. Joining the previously announced keynote speaker, John Venhuizen, president and CEO of ACE Hardware, is Tim Blumenthal, president of PeopleForBikes, the nation’s leading bike advocacy organization. Interbike announced the schedule for the 2018 edition of its Electric Theatre, epowered by Bosch. Now in its fourth year, the educational track for electric bicycle retailers will be held each day of the tradeshow in Hall 3 of the Reno-Sparks Convention Center. Interbike announced plans for the second installment of its successful retailer education series, The Forum, which will be held each day of the tradeshow in the Reno-Sparks Convention Center. The Forum, presented by eBay and held on the show floor in Hall 2, features retailer-centered educational sessions that are 30 to 40 minutes in length. Interbike announced more details surrounding OutDoor Demo, including participating brands, product testing loops, dining options and more. Taking place at the Northstar California Resort in Truckee, CA, OutDoor Demo is set to feature more than 75 leading brands, offering the most robust product testing experience for the bicycle industry in North America. Interbike announced the addition of a new featured area of the expo located just outside the door of the Reno Sparks Convention Center, that will incorporate brand booths, The Circuit test track, ePowered by BOSCH, food and beverage options, shaded seating and more. Interbike announced the addition of a new educational track whereby key retailers will share their experiences on specific topics relevant to all IBD’s today. These Retail by Retailers sessions will be presented in either a one-on-one interview or panel discussion format. Interbike announced that Matt Powell, Vice President and Senior Industry Advisor, Sports for The NPD Group (NPD), will present the latest retail and consumer shopping trends in the cycling industry to event attendees at the show in September. More key brands in several categories have committed to Interbike Marketweek, as momentum both on the brand and attendee side continue to rise as the Reno Tahoe events begin in 102 days. Interbike announced the initial wave of content and schedule for the IBD Summit at Interbike retail education track at Interbike 2018. This new track brings the same type of high-level speaker that the IBD Summit was known for to the Interbike audience at no charge. Interbike announced that key brands in several categories have committed to Interbike Marketweek, as registration opens today for all attendees including retailers, distributors and media. While the Northstar Free-Ride Festival, OutDoor Demo and the indoor expo have brands committing on a daily basis, a number of key brands have shown their early support for Interbike Marketweek in Reno Tahoe. Interbike, in partnership with Northstar California Resort, revealed today a number of event features and activities as well as the official name and logo of the new consumer festival set to take place September 14-16, 2018 in Truckee, CA. Interbike announced plans to create a new video series that speaks to the value of trade shows for all attendees, gives a visual preview of the Reno Tahoe area for those curious on what to expect, and highlights numerous aspects of the upcoming Interbike Marketweek in September. Interbike partneres with BikeFlights.com, a bicycle shipping service for cyclists, to offer a simple solution for all Interbike attendees who plan to bring their personal bike along with them. Interbike announced plans to create “Source” within its 2018 show, a new strategy to help facilitate OEM and sourcing conversations between component and accessory manufacturers with product managers and distributors. Interbike staged for the final time in Las Vegas as it marked the end of an era and set its sights on its new home in Reno Tahoe for 2018. America’s leading cycling trade show is pleased to announce it has selected Reno-Tahoe as the new home for the Interbike trade show and the site of the newly-created Interbike Marketweek. 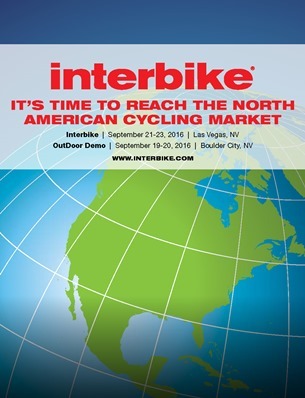 Despite current market conditions in the North American market being difficult, Interbike continues to demonstrate its ongoing commitment to being North America’s ultimate gathering for retailers to see the latest products and services in the bicycle industry. Interbike, the largest bicycle industry trade show in North America, is presenting an updated turnkey booth section on the show floor. It’s designed to highlight European brands seeking to enter the US market for the first or second time. Exhibitors, retailers and media expressed positive commentary, noting that feedback from the show floor and at OutDoor Demo was favorable and complimentary. Interbike’s annual awards gala didn’t disappoint this year. Hosted by comedy veteran Alonzo Bodden, the awards ceremony presented more than 35 winners with the coveted IB Award. Interbike today announced the launch of a new four-day demo event that focuses on East Coast bicycle retailers and their staffs at the onset, and ends with a two-day consumer demo and music festival. Interbike today announced several new initiatives planned for OutDoor Demo, including the return of several brands, new events and a new Ride 2 Recovery Route. Interbike today announced two fundraising initiatives designed to raise funds for World Bicycle Relief. Interbike continues to demonstrate its ongoing commitment to being North America’s ultimate gathering for retailers to see the latest products and services in the bicycle industry. Interbike announced the first round of categories and nominees for the 2015 Interbike Awards (IB Awards), including product, retailer and supplier designations. Interbike, the largest bicycle industry trade show in North America, announced a strategic partnership with Extra Energy Services North America (EESNA) today to bring a unique, purpose-built test track indoors to the show for attendees to evaluate the performance of a variety of motor systems and bicycle designs, including E-bikes, Fat Bikes, and Urban/Lifestyle bikes. Interbike, the largest bicycle industry trade show in North America, is launching a new turnkey booth section on the show floor designed to highlight European brands seeking to enter the US market for the first time.